Welcome to the more than 50 islands, keys and rocks of the British Virgin Islands. Your first stop is most likely on the island of Tortola, the largest and busiest of the British Virgins. In Road Town, walk along charming Main Street where most of the old buildings are located. Stop at the B.V.I. Folk Museum in a typical West Indian building. Also in Road Town, see the J.R. O'Neal Botanic Gardens, covering more than four acres. Here you can identify the countless tropical flowers, herbs and plants native to the islands. 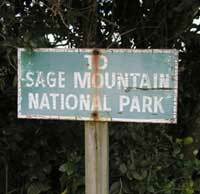 Sage Mountain National Park is the highest point on Tortola, at 1,780 feet, and contains the last remaining Rain Forest. Also hike the Mahogany Forest Trails in this 92-acre preserve. These are both areas protected by the National Park Trust, shown on the maps with the Trust's "sea turtle" symbol. The world's most beautiful beaches are shown on this map with the "umbrella" symbol. Cane Garden Bay is one of the most popular -- with a mile and a half of white sand and coconut trees for shade. Go west to the surfers' favorite spot, Apple Bay, where lunch at the Sugar Mill's beach bar is always delightful. Continue west to Long Bay, a good spot for beach walks and snorkeling. Sopers Hole at the West End is a port of entry (mainly from ferries from the US Virgin Islands). There is a cluster of shops and restaurants by the water, all painted in bright colors. It's a good spot to watch the yachts come in to clear customs. Ferries for the USVI and Jost Van Dyke leave from here. A trip to Great Harbour beach on Jost is fun. There's a bakery on the beach and local shops where homemade chutneys and jellies are sold. A rum punch and a meal at Foxy's could be the highlight of your trip, and don't miss a boat ride to White Bay and the Soggy Dollar Bar (the website makes it look sort of staid - believe us, it is one of the best bars in the world!). On Beef Island, Trellis Bay is a breezy beach loved by board sailors. You can rent equipment and try boardsailing yourself. Don't miss Virgin Gorda (see A Day On Virgin Gorda). A day trip by ferry from Road Town is a great adventure. Visit the world famous Baths area, including Devil and Spring Bay beaches and the wildlife sanctuary of Little Fort. The Baths is world renowned for snorkeling and scuba diving. For hikers, there's the trail to Gorda Peak through Gorda Peak National Park. Sailors tell you the best way to visit these islands is by boat. Salt Island is one of the many accessible only by private boat. A bag of salt is sent each year to the English monarch as rent for the island. Other stops on a boat trip could include Norman Island and the Indians for unsurpassed snorkeling. These areas are under the protection of the National Park Trust. Call 494-3904 for information about moorings. The British Virgin Islands are as lovely underwater as above. There are over 60 charted dive sites. Many fine dive shops and PADI certified schools make the underwater sights accessible to all. Popular dives include The Wreck of the RMS Rhone, sunk in about 80 feet of water in 1867, Painted Wall with corals and sponges, and the caves of Blonde Rock to see reef fish. You may catch the Annual Flower Show at the Botanic Gardens, BVI Spring Regatta with yachts from around the world, or Festival, a colorful West Indian carnival. Blue marlin bring anglers to the BVI for the tournament held in prime season, June through August.